Bathroom furniture is a key ingredient to a beautiful bathroom! Bathroom cabinets create style and storage while bathroom vanities whether single vanity or double vanity add class and a dash of flare. A single sink vanity or double sink vanity can be the most admired accent in your bathroom. A bathroom vanity adds a high end quality to the bathroom, and can be completely customized to go with the design flow of the rest of your home. 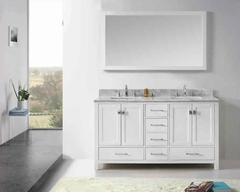 Bathroom vanities come in many different sizes, styles, colors, materials and finishes. You can choose to incorporate drawers and cabinets in any design that fits your need and your bathroom space. There are so many choices that range from, custom bathroom vanities, single-sink vanities, corner style units, double sink vanities, and more. With so many options the possibilities are endless and your satisfaction is certain. Storage space is a great consideration when choosing your bathroom vanity. You need to be sure that you have a bathroom vanity that is attractive and will make the bathroom look tidy and clean. The bathroom cabinets and vanities that you choose are a huge part of updating the look of your bathroom.